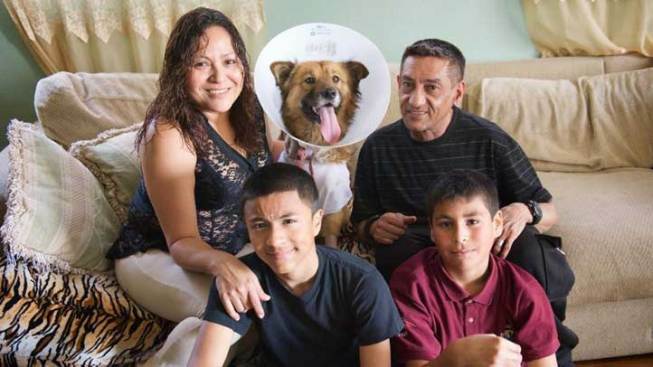 Charlie happily sits with her family on Monday, March 3, 2014, since undergoing surgery to have her leg amputated after heroically taking a bullet for the family's children. A dog who faced intruders and took two bullets for her family is recovering from surgery at home thanks to a shelter's crowdfunding campaign. Charlie, the now-three-legged dog, had to have a leg amputated after stepping in to save her family last weekend. Charlie was at her Los Angeles home with her two pup siblings and family when two people broke into the home. The three dogs chased the intruders into the street. One of the intruders fired shots at the pets as he ran away and struck Charlie in two of her legs, according to the North Central Shelter's Facebook page. One of the other dogs tried to push Charlie back inside the house after she was hurt. If Charlie had not been in the line of fire, bullets may have struck one of the family's children, the dog's owner told the shelter. After police arrived, Charlie had to be taken by Animal Control to the North Central Shelter since her owners could not afford to get her to an emergency veterinarian on their own. The technician who put Charlie up for the night reached out to the North Central Shelter Intervention Program, which helps owners find resources for their pets, to see if they could help get Charlie medical help and reunite her with her family. And help they did. The program, along with the Bill Foundation, started a crowdfunding campaign to help Charlie's family pay for surgery, and more than $8,000 has poured into the online bank account -- more than double the original goal. "Please help us raise the funds to help this loyal and heroic dog get the care she needs. And reunite her with her family! She misses them very, very much Every little bit helps," the shelter posted on the YouCaring funding site. Charlie successfully underwent surgery to have one of her legs amputated. The family says their pet pooch is as happy as ever, strutting around on three legs and giving plenty of kisses. The family, overwhelmed with gratitude for those who stepped in to help, welcomed Charlie home Feb. 27, and the shelter stopped by Monday to take pictures of the happily reunited family, Charlie smiling and licking the faces of her parents and shelter program helpers (pictured at right). Charlie's owner told the shelter that once Charlie got home and saw the children, she quickly stood up and started walking. Though Charlie's surgery came with a hefty price tag, the extra thousands of dollars in donations will go to the Intervention Program to help other pet owners find help they need. Anyone who wants to donate to the program, they can visit Charlie's crowdfunding page or email ncintervention@gmail.com.